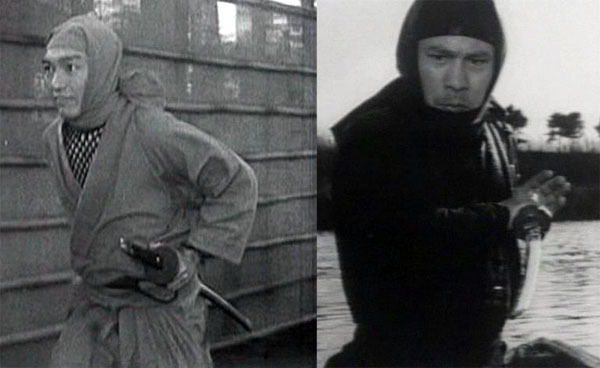 One thing you hear over and over from the anti-‘Ninja-To’-sword-haters-club is the blade is “pure Hollywood.” Before this recent spat of research and over-scrutinizing swords in old movies, I used to argue against that notion; the Japanese studios got ninja ‘wrong’ decades before we did, right? And the blade was sold mail order well before our ninja boom, so Hollywood sure didn’t invent the sword. It wasn’t even used in The Octagon (1980) or Enter the Ninja (1981). BUT, what can be said is “pure Hollywood” is the narrow strictness of the visual shorthand for ninja. 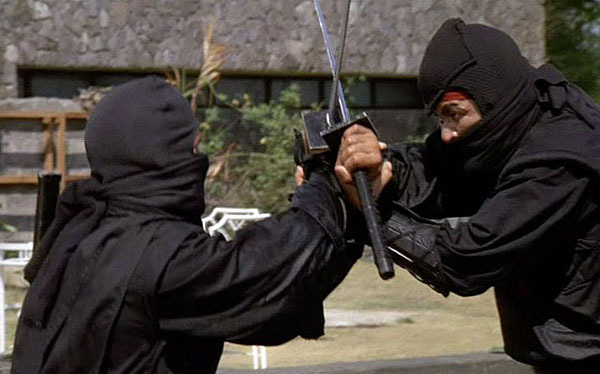 From 1982’s Revenge of the Ninja onward, the regulation ‘Ninja-To’ was absolutely chiseled into the vocabulary of ninja in American film and TV. The sword was so well branded here, Kosugi or Dudikoff using a curved blade would have been seen as a blasphemous prop master’s error. 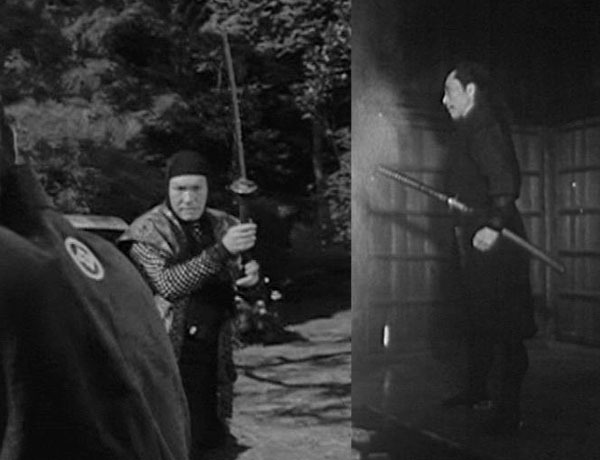 The Japanese were, as with manga, much less narrow in their use of screen props, however their use of a sword for a shinobi character carried additional editorial significance. 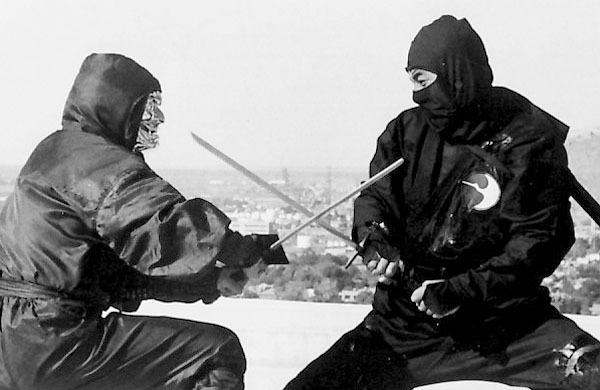 Whereas American films were typically ninja vs. mobsters, drug lords, night shift security guards and sometimes other ninja, Japanese movies typically featured ninja vs. samurai. Samurai use long, ornate blades that make statements of their social rank and wealth. A ninja’s cruder, less decorated blade is an indication of lower social rank. It says his sword is not his soul, but a tool to get a job done. At the same time, the shorter blade when used against full-length katana in the hands of an armored warrior says volumes about the ninja’s skill and courage. So let’s take a look at some different swords in the hands of shinobi. 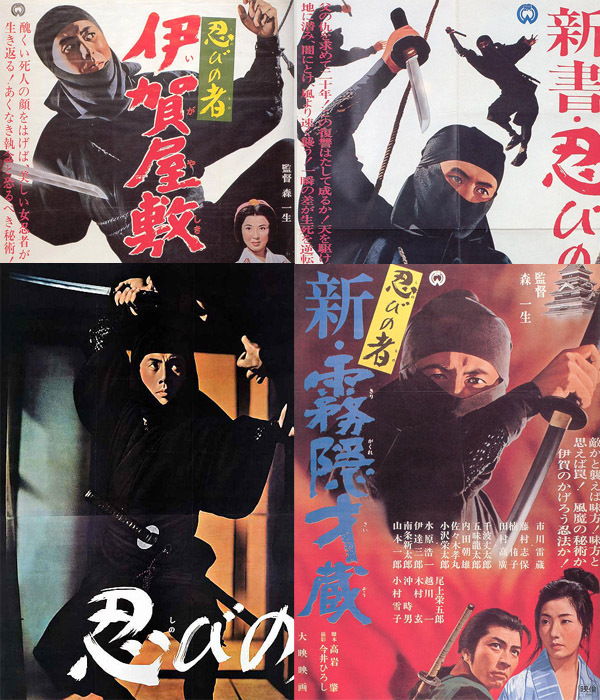 We’ll start with the most historically credible ninja films ever made – the Shinobi-no-mono series. But hey! Is that a straight blade??? 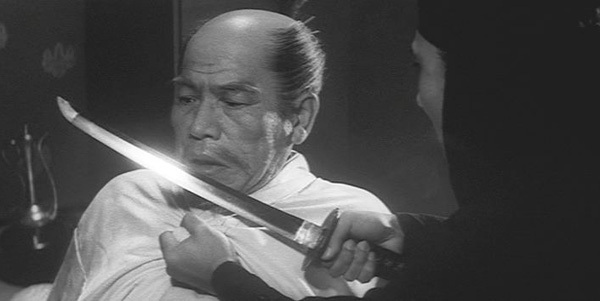 I’ve had a few people refer me to this photo in opposition to statements I’ve made about the lack of short, straight blades in Japanese ninja films. And yeah, that is Raizo Ichikawa holding an apparently straight blade made by a studio prop master under the guidance of tech advisors like Takamatsu Toshitsugu and Masaaki Hatsumi. Hmmm. Why was the poster image altered to reflect a more traditional sword? Or was the publicity photo above retouched? And was it altered by Daiei back in the 60s or by Animeigo for their recent DVD packaging? 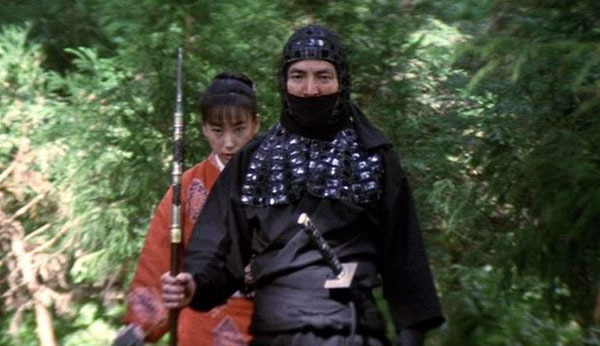 Point I’m making here is even with the Bujinkan tech advisors on board, the blades are inconsistent between the Shinobi-no-Mono films, and they sometimes change from shot to shot. So don’t go putting too much importance behind any single still. Above, two publicity shots with two different props. Rather than an editorial statement, this is more likely just the difference between what is called a “hero prop” – in this case a character’s signature sword, which they only might have produced a few copies of – and a more disposable prop used as a ‘stunt double’ if you will, for quick-cut fight scenes where the piece is more likely to be damaged. 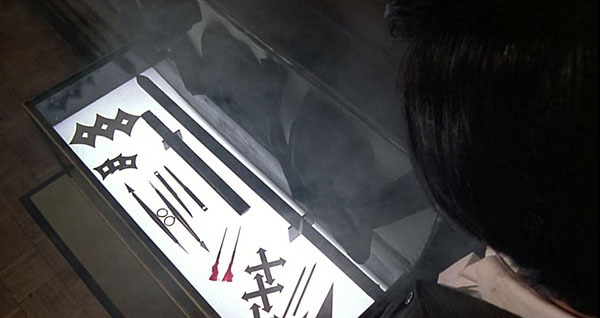 Raizo’s “hero props” changed from film to film as well – note the different tsuba below. Sheath length also varied, but the blade was always short (signature Hatsumi!). And not all Daiei ninja used such swords. Battle scenes involving multiple extras and stuntmen as Iga clansmen revert to plain katana and wakizashi. Budget saving measure, or where they embracing the notion that blades would differ from man to man, mission to mission? Now, I’ll pose a question to everyone who’s seen these films. I think there’s actually an ever so slight CURVE to this blade. What do you all think? Hard to tell. I’d kill to see this prop, if it still exists. If there is a curve, it is so minor, changing perspective straightens it right out. And here’s another question – why the hell hasn’t someone replicated this awesome baby and sold me ten of them? WHY?!?!? Meanwhile on the small screen, Onmitsu Kenshin (aka The Samurai in Australia) was absolutely bursting with ninja during its 60s-long run. Prop swords varied from season to season, with a limited TV budgets always the deciding factor in style. Note Tonbei the Mist‘s wakizashi with oversized round tsuba, in comparison to the standard swords of the hero Shintaro. The good Iga ninja always used these, while the evil ninja clan-of-the-season would have various plain swords. There was, however, a recurring sword used for the several seasons’ boss villains – an absolutely monstrous ‘horse cutter’ (I think?) with a handle as long as its blade. I love this freaky thing! 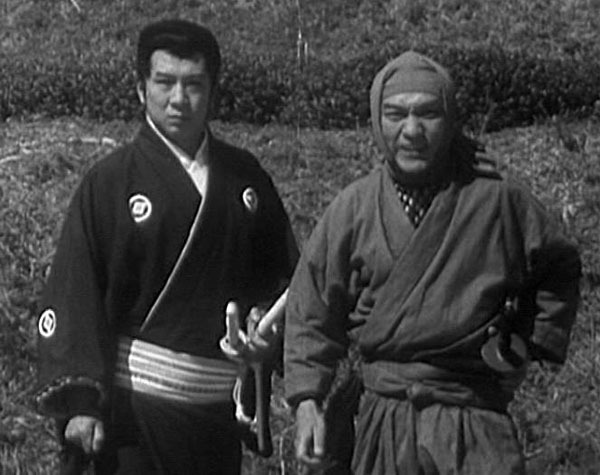 The 60s weren’t all gritty, B&W, espionage-based, hard ninjutsu, though. There were as many swashbuckling adventurers and colorful plucky heroes as tormented shadow dwellers. Plenty of heroes who were of otherwise samurai status as well, so they used their same trusty blades when on night missions. That’s one of dozens of ninja mowed down in the Lone Wolf and Cub films, and the above style sword was standard issue in 70s and 80s films. 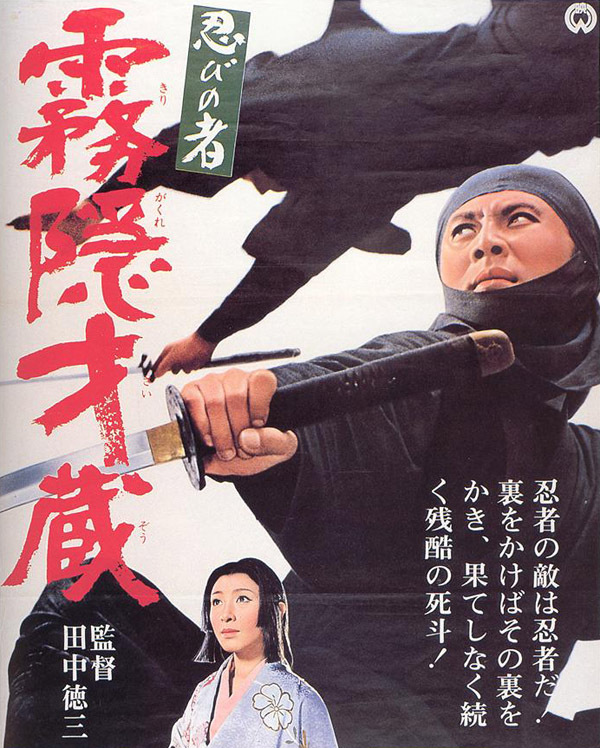 Shogun’s Ninja (Ninja Bugeicho: Momochi Sandayu – 1981) features two competing forces of ninja, both using the same medium length curved blades with plain handles and square guards. 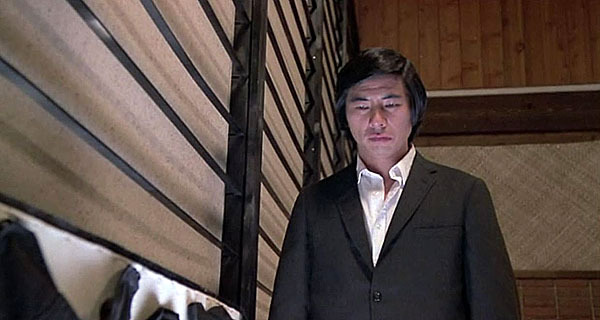 The same year, Enter the Ninja began Sho Kosugi‘s assault on America. Mike Stone‘s weaponry was custom, not mail order, and the swords were closer to the Japanese studio model. But in 1983, the smoking chest was opened, and there it was! 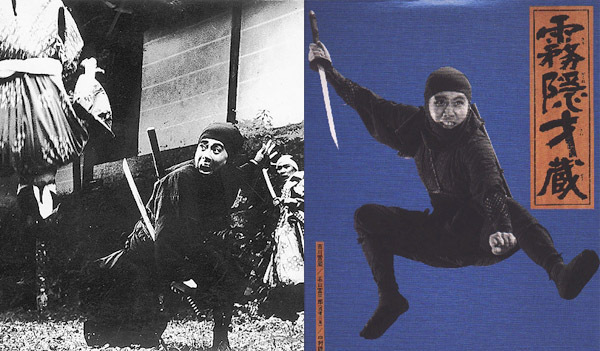 From Revenge of the Ninja on, Kosugi was in charge of choreography and props, and never strayed from the short, straight blade with long handle and square guard – used by ALL ninja – heroes, villains, rival clans, students, masters… everyone. He even made his own in Pray for Death (1985), a scene that drove Tim and I nuts because the sword he supposedly forged real quick during his power-up montage ends up a fully decorated blade with ornate hammon line, right out of the prop bin. When the Cannon Films ninja mantle was passed to Michael Dudikoff, so too was the now requisite ‘Ninja-To,’ seen throughout the five American Ninja films that closed out the 80s craze. And at the same time in Japan? 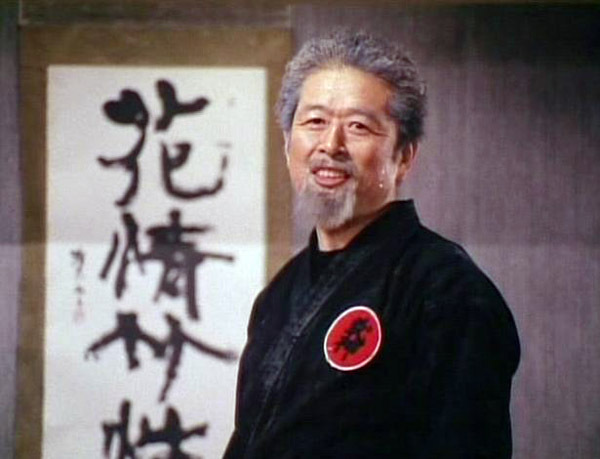 Masaaki Hatsumi was a big part of the kids’ show World Ninja War Jiraiya (Sekai Ninja Sen Jiraiya – 1988), which featured a variety of outre ninja-based characters with just as wide a variety of swords. 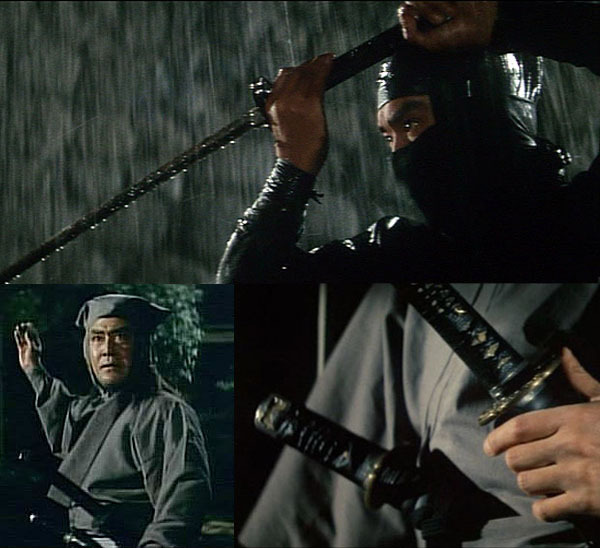 Coming next: A look at Kosugi’s officially licensed swords, and some props from our own collection here. I’m working my way through the Shinobi No Mono series, in the 4th movie Hanzo is seen at the beginning outside Tokugawa’s camp wearing what appears to be a straight scabbard with a relatively square tsuba…this is confusing to me. Patrick, that isn’t Hanzo in the 4th film, but Yotoji. Hanzo doesn’t pop up until the 5th film again. Anyway, huge SHinobi no Mono buff from the time where you had to pay $40 a piece for the VHS from Merlin when they were first subtitled. Watched them all dozens of times. Just wanted to comment that Raizo’s short straight blade in the scene with Hideyoshi from the third film, that’s actually curved. Not by much, but you can tell because of the handle/tsuka curving back upwards (or if you draw a line from there to the tip/kissaki you can see the sori there). On very short blades like that, the curve becomes less and less unless designed otherwise. But most of the time it’s the same curve as a longer katana, but when it’s shortened you’re seeing so much less of it. I know, because I’ve done this in replicating the awesome SNM style sword 🙂 (right now Sino forge has the closest thing to this, although their blade is 100% straight). Some of the ones on the posters are definitely straight though, no doubt about that. Weather they’re straight because they were actually straight, or simply drawn that way, is another story. Oh what I would give to go through that prop room!